(he/his/him) Calvin Eaton aka theglutenfreechef (www.theglutenfreechefblog.com) is a digital content creator, social entrepreneur, and educator whose area of expertise includes antiracism, diversity, inclusion, K-12 curriculum writing and teaching, gluten free plant based living, and higher education. In 2016 he founded 540WMain Communiversity a grassroots non-profit community based university. 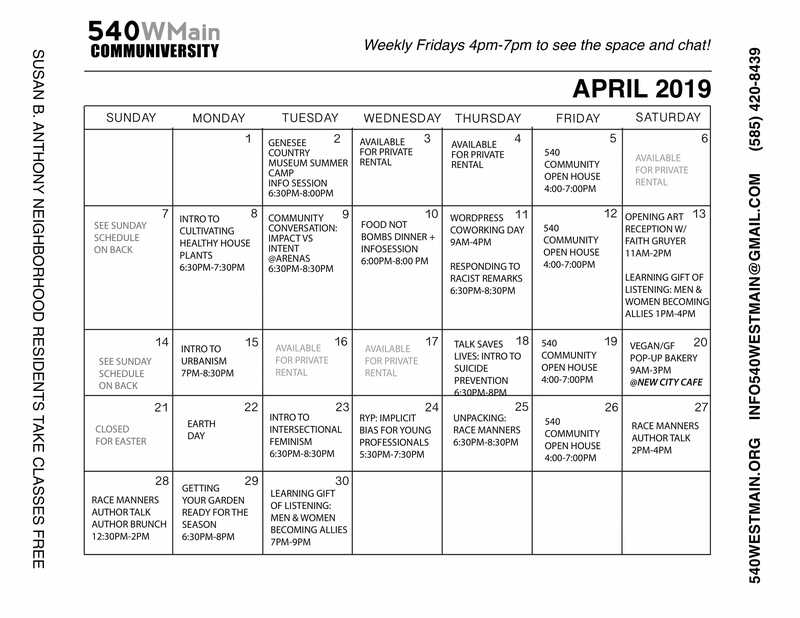 (www.540westmain.org) with a commitment to enrich the Susan B. Anthony Preservation district as well as connect greater Rochester to the neighborhood through historic preservation, sustainability, workforce development, and antiracism education. (he/his/him) Ray Ray Mitrano loves to participate in community events, performances, workshops, and group exhibitions. Interactive storytelling is a major part of what he does, whether it involves drawing, animation, education, performing, videography, or multi-media installation. His experimental work embraces collaborative improvisation within conceptual frameworks. In addition to his freelance art and activism practice; Ray Ray is the brains and face behind 540WMain’s social media advertising and weekly HQ community classes respectively.